Our old pillows were getting pretty shabby - so I decided to redo and give some of the others a little face lift. The material was from an old quilt top that had pieces in very bad shape - so I cut it down and free motion quilted the heck out of it and then made the top into pillows. The tan pillows were not in too bad a shape - so I put some applique on top of them from the same quilt top. I use regular bed pillows (feather) for the large pillows and put two padded pillow protectors on them to make them extra squishy. They are much more comfortable than the pillow forms you can buy at craft stores! Great for a nice nap on the couch! The small square pillow was made over from left over quilted fabric, denim and buttons. I came into our bedroom and found another one of our kitties had adopted the little doll bed as his sleeping spot! This is Jasper - the little cross eyed one year old. He is such a sweetie. He definitely fits better than our big cat Tommy does. I am taking an online class from Machine Quilters Resource called Color and Design for Art Quilters. The first assignment was to create a color wheel. It was allot of fun to do and I also practiced free motion embroidery for the first time (the ladybug.) I have never been trained in color use - I just use what I love and sometimes it turns out well and sometimes it doesn't! That's the nice thing about scrap quilts - they usually turn out great no matter what you pick!! This is a 16" X 20" quilt I finished from a pattern that I bought at Little Quilts. It's by Lori Smith of From My Heart to Your Hands. I love her pattens! This is the first of one of her patterns that I have made - and will definitely be making more. In June my husband and I took a drive down to Virginia and Georgia to see our girls and son-in-law. We had a great time and just reinforces my wish to be geographically closer to them! It seems most families are spread apart these days - I still don't have to like it though! Anyway, on the way back from Georgia - we drove right by Marietta, GA and had to stop at "Little Quilts." I love "Little Quilts", they were some of the first quilts I made. I completely wore out my first book so I bought another at the store. I was able to get it autographed by Mary Ellen Von Holt,very fun! Here are some of the goodies I got! It's Christmas in July! I was at the LQS last week and saw a wall full of stockings - there must have been at least 200 of them. I found out that they were for the "Operation Support for Deployed Military" program. I have a soft spot in my heart for the military and their families, as my husband is retired Army. So I ended up making 9 stockings. The material was originally for sleep pants for my kids - I think about 8 years ago! Hi! Weird title for a post isn't it! I can't believe it has been since Mother's Day since I last posted! But I have been blogging in my head! I am writing posts in my head all the time! I just don't seem to get them translated into my finger tips on the keyboard! Does anybody else do that? I'll try to catch up with what I've been up to in the next few posts. My husband brought over some tulip bulbs from the Netherlands last fall on a business trip and they just bloomed - they are so pretty! The last owners of this house loved to garden - so I am happily discovering all the beautiful perennials they planted. This is my 100th post! I never thought I would blog this long - as I am not a diary person - but this has definitely been fun! I've "met" allot of great woman all over the world! In honor of my 100th post, I'm posting a free pattern for a quilt that I designed and made for my daughter and her husband when they purchased their first home. It is foundation paper pieced and the second picture shows it framed. Click here for the free pattern! I've been working on challenging myself to make free form quilts. It really is allot of fun. This quilt was made with fusible web and antique "cutter" quilts and lots of playing with thread. It was so fun not to have to match seams and just go for it! I had bought a tyed quilt from Ebay probably 5 years or so ago. When I received it there were actually 2 more quilts hidden inside! It was amazing. The very first quilt is I'm guessing from the 1870's or so and hand quilted, mostly threadbare though. 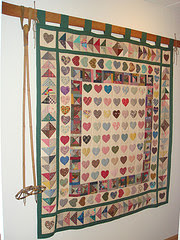 The second quilt was from the late 1800's or early 1900's and was tyed. This was in better condition but still a cutter. The third layer was made in the 30's, was in better condition but still I would consider it a cutter quilt. I've always wondered what I should do with these quilts. I've always hated the thought of cutting something up that someone has made, but, the way they were was definitely not useful. So in a weak moment I cut into them, saving the larger pieces that maybe can be made into a doll quilt. My Lamb Quilt is the result. I had to do allot of machine stitching to stabilize the old quilts but I think it turned out ok. I think it would look really cute in a child's room. Ed and I headed to Chicago Saturday for the IQS quilt show. It was a beautiful show. I didn't take any classes, but was content to look at all the beautiful quilts and of course the vendor area! I played with allot of the long arm quilting machines - they are allot of fun - but the price has always scared me off! Maybe when I win the lottery! Ed doesn't mind going to the shows with me - and I'll tell you why. We went to the Mid-Atlantic Quilt show several years ago when it was in Williamsburg, VA and very, very crowded; you could barely move through the vendor area. I won't go into much detail here but lets just say he was inappropriately groped and not my me! The quilt shown won the Best of Show Award- "I Ain’t No Spring Chicken" is 57” x 39” and was made by David Taylor of Steamboat Springs, CO. It really is a fun and beautiful quilt. 2600 miles and 33 hours of driving in 4 days! I am whooped. Ed and I drove from Iowa to Harrisonburg, VA to move our daughter, Kelly to Augusta, GA - in 4 days! We are crazy, but that is all the time Ed could get off from work. It was wonderful to see my girls and son-in-law and wonderful to see all the blooming trees and flowers! I love the South and can't wait to get back to living there! It is such a pretty part of the country. There is nothing like Spring time in the South. I had my fill of "good" sweet tea too! On the drive back to Iowa, we drove by Paducah, KY and of course had to drive through the town! I had never been there before - I thought it was very pretty. On the way back to the interstate Ed had to stop and get some gas - and low and behold it must have been quilter's karma - Hancock's of Paducah was right next to the gas station! Very fun!! I was embarrassed to take pictures so I asked my husband to do it. He's so nice. I couldn't stay long, but long enough to pick up some bolt ends of Kona cotton - at $1.59 a yard. Hard to pass that up! It has been snowing all day, enough already! My fake spring flowers make me happy though! There is a guy in town that has a salvage business and I love to go there and look through the treasures in his shop. He makes these flower garden stakes out of old wood - and I just fell in love with them. I had to post pictures of my cat, Tommy. He is about 7 years old and I adopted him from the pound when he was a year old. He is such a funny cat - such a tom cat! I picked up this little doll bed when we lived in the Netherlands and put a quilt on it - Tommy has adopted it as his bed! I took his picture and he woke up and gave me the "go away" look. Well, enough freaky old cat lady for the day! I think sometimes it takes me longer to put the binding, sleeve and signature on a quilt than it does to make the quilt itself! You can definitely tell what parts of quilting I don't get very excited about! Anyway, my Dutch quilt is finally up on the wall! Even though it is still winter outside I can have Spring on my windowsill!!! I have decided to start selling some of the jewelry I make on Etsy.com. I love to make jewelry and sometimes get comments on things that I make so I thought - why not? We'll see what happens! It sure is pretty isn't it? I refuse to complain about the amount of snow today. I am redirecting my negative thoughts into positive thoughts for the victims of those awful storms in the South yesterday, as I write this 49 people have lost their lives. It looks like those storms are headed farther east today. God bless those people. The news said some of the tornadoes came at night, that brought back memories of what my mom used to say to me. She said tornadoes never come at night! I think parents will tell their children ANYTHING to get them to go to bed!! I also remember about being told if you hear the sound of a train coming - take cover, it is a tornado. Well, being from a railroad family I always listened for a train whistle!!! I wasn't the brightest kid! I love flea markets and you can usually find pretty good deals on salvage pieces of old furniture. I saw these old moldings and turned them into quilt hangers. I used large cup hooks and screwed one into the bottom on each side and then put a hanger on the back. I used a regular cafe curtain rod to hang the quilt through its sleeve and placed the rod on the cup hooks. For the quilt hanger to the left I used a pair of old skis and poles that we picked up at a yard sale when we lived in Alaska. I tied the skis to a nail in the wall with jute thread since I didn't want to damage the skis. It is 6 degrees outside right now and I have no heat! Turns out I haven't had heat for a couple days, I just didn't realize it until the temperature dropped outside yesterday morning. I guess our house is pretty well insulated so that is at least a good thing. I have the fireplace going so that helps, three of the kitties are curled up by the fireplace and the other one was curled up on my lap and not happy that I got up to do some chores around the house. Hopefully the furnace will be fixed tomorrow morning -so for tonight I will be sleeping on the couch! I'm still working on machine quilting the Dutch Tulip Quilt so there is not much new to share. I thought I would share something older. My husband retired from the Army six years ago and I made him a retirement quilt to pin all of his past company insignia on. I paper pieced it and then hand quilted it. During some of our moves I think a couple of his pins have been misplaced, so hopefully he can get some new ones. My Dog has me thoroughly trained! It's hard to be mad at a dog that looks this ridiculous! I've learned that Golden's are notorious for "stealing" things. Uh, yeah, I guess so!!! What a stinker. If it ain't nailed done he thinks it is fair game. I won't list the things he has gotten into because I don't want my husband to get mad at me all over again, let's just say I have had to replace quite a few things, including my quilting gloves! We are still going to obedience classes and it is helping, but I think we still have some major work to do! Every year bald eagles from the North migrate to the Quad Cities area to hang out for the winter. Due to the locks and dams on the Mississippi River in this area, the water does not freeze solid so the eagles come here to fish. Yesterday was the first time that we saw them - it was AMAZING!!! In one area alone there had to be at least 100 Bald Eagles sitting in the trees. They are such huge birds, I never realized that they were so large! We got to see them soar over the river and look for fish and then dive and pick one up - truly amazing! We saw some nests but not too many, I'm thinking they were probably deeper in the woods and people are prohibited from walking back into the forest. It was hard not to get teary eyed while watching those beautiful birds. I grew up only about 45 minutes from the Quad City area and had never heard of the eagles here. I learned that the eagles were on the endangered list and there were not many left. Thankfully, the last 15 years or so they've made a wonderful comeback. Click on the picture for a better view of the eagles. The picture with the single eagle in it is of a younger eagle, he doesn't have his white head or tail feathers yet. I felt silly with my tiny Sony camera, most people were there with major, professional heavy duty cameras! I have more pictures in Webshots if interested. And it's only January! I'm so ready for spring. This is a quilt I just finished putting the binding on. The blocks were from a block of the month club from High Country Quilts in Colorado Springs. I was glad to see that it was still there when I looked online, it's a great store. We lived in Colorado Springs over 8 years ago! Yes, it does take me along time to get things done! The original blocks had art nouveau flower appliquéd in them, but I'm not a really big fan of that style, so I replaced them with Grandmother Flower Garden flowers. I love the bright colors of the quilt, I think that originally drew new to sign up. The blocks are hand pieced and the borders were put on my machine and then machine quilted. When we moved from the Netherlands in August we had these cupboards from Ikea that we had bought for our clothes since our apartment did not have built in closets. Of course we do not need them here in Iowa for our clothes - but they make wonderful storage for my quilting room! We took a spare bedroom in the house and turned it into a sewing room - it's great to have so much space to spread out for a change. The picture to the left shows my flannel board. It is made out of a preprinted flannel piece of fabric that I picked up at the local quilt shop. My husband and I wrapped it around a thin piece of particle board and hung it on the wall. It works great and no more cats on the floor laying on my quilt blocks! I used to collect crocheted potholders from the 40's and 50's - I looooooooove them! My husband hates them though so I put them in my sewing room as valances for the windows. They are so fun to look at and I love the bright colors. Hi! I've been quilting for the last 15 years, appliqué being my favorite. I love to adapt traditional designs into something folksy and unique. I collect reproduction fabrics from the 1800's and have more ideas in my head than I can possibly complete. 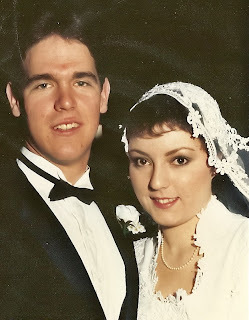 My husband and I have been married for 26 years and have moved 19 times during that time. Lots of stress but lots of fun too. Of course lots of wonderful quilt shops along the way too! This blog is about me, travels, family and of course quilting!!! 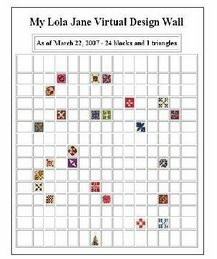 Visit Lola Quilts for free and for purchase patterns that you've seen on my blog! All contents of this blog are the property of Laura Jasper and cannot be reproduced in any way without prior written approval.